Who We Are And How We Can Help You With Your Project? Ian Scothern joined Scothern Construction as a Director of the company in 1992 from Simons Construction Ltd where he was the Managing Director. Mark Scothern joined Scothern Construction as Director of the company in 1990 from Simons Construction Ltd. The combined experience of the company directors within the construction industry is in excess of 60 years. 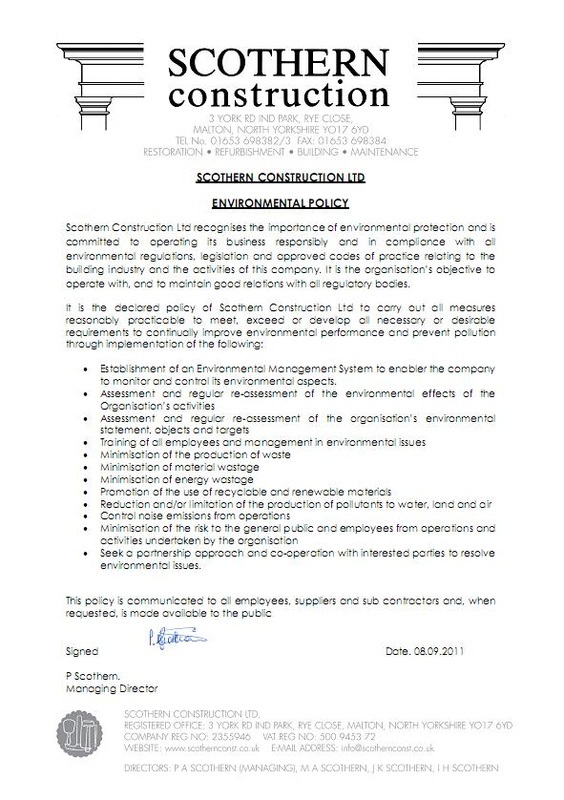 Scothern Construction Ltd is a Private Limited Company and has a sister company Scothern Developments Ltd which was formed in 1995 and has a portfolio consisting of a wide range of properties. Our aim is to build a company with traditional values in a modern day construction industry which can carry out and complete projects in a correct manner in order to achieve the highest quality of finish possible. This we believe is best achieved by having good management systems in place and skilled craftsmen who have proven their knowledge within building construction and building refurbishment. These craftsmen are full time employees of Scothern Construction, who with many years of service are highly skilled and have achieved the highest level of qualification in general construction and specialist heritage restoration works. This provides us with the confidence that the works we undertake will be completed on time and to the highest standards. To maintain these high standards we have set too, and become an approved building contractor for Constructionline, a government approved body that has assessed our quality of systems of work, health and safety procedures, financial standing and our ongoing training and investment schemes. We have achieved CHAS Accreditation and certification to the OHSAS 18001:2007 Occupational Health and Safety which shows our commitment to maintaining high levels of Health and Safety Standards. 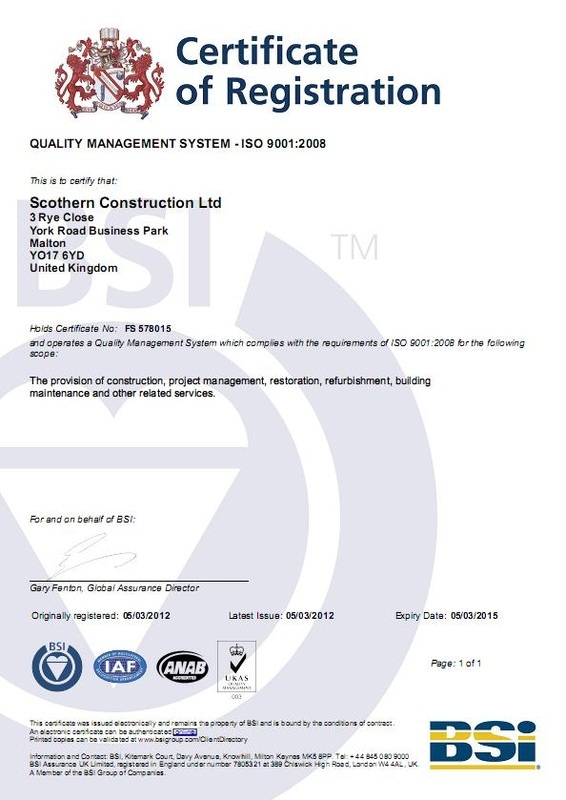 We have in place a Quality Management System certified to the ISO 9001:2008 Standard through BSI, which shows our dedication to quality and efficiency in the construction industry. We have in place an Environmental Management System certified to the ISO 14001:2004 Standard which enables us to ensure that we undertake our projects with consideration for the environment and the impact that our procedures and processes will have. We undertake regular training sessions with our employees to further develop their knowledge, awareness of their working environment and to build on their skill base. This also enables them to have a say and input in to the company. This however only can work by having good working relationships with our clients and their consultants. We are happy to say that we regularly work with architects, surveyors and engineers on a repeat work basis and have built up strong relationships with local authorities, county councils, schools and colleges, factories and the brewery industry. This enables us to continually develop and build on our success.